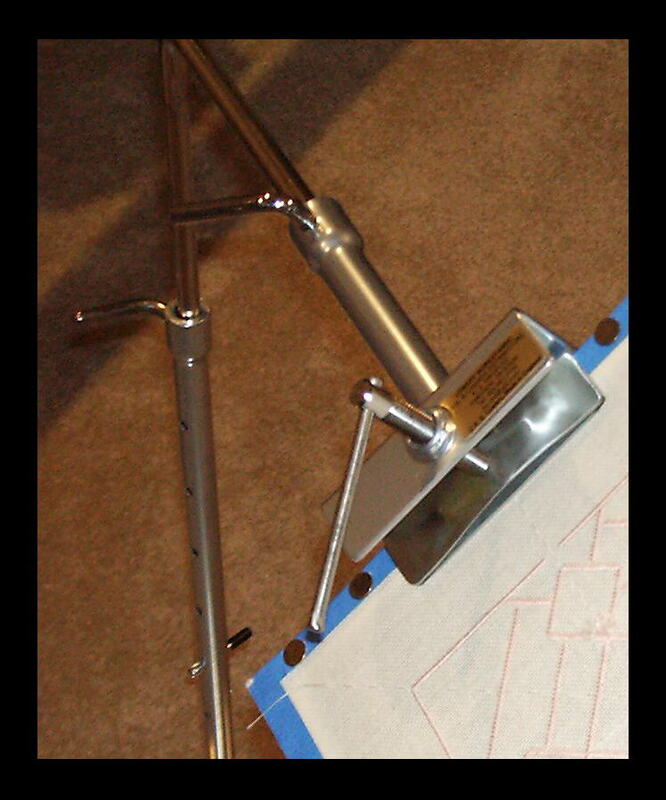 The Lowery floorstands are made in England of high quality steel (available in silver-grey or stainless steel). 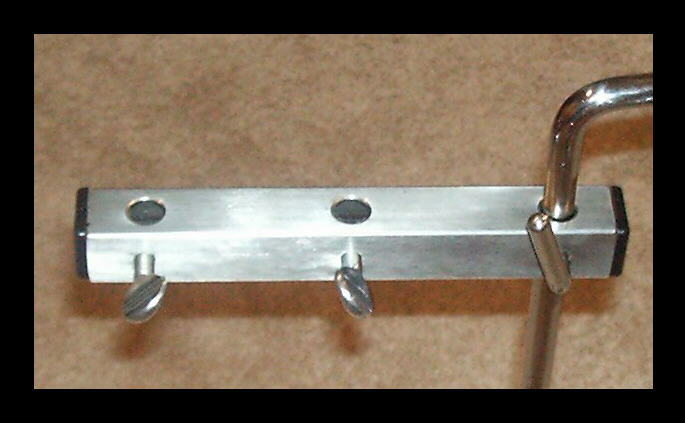 The bases of both stands are made from strong but light 6 mm thick hard grade aluminum. They have been manufactured and enhanced since about 1985 and the resultant stand is a very high quality, relatively light weight, extremely portable stand designed with enough flexibility to accommodate almost every stitching situation. The stainless steel and the silver grey steel are similar but slightly different in thickness, so the accessories must be ordered specifically for the type of stand. The height is adjustable by means of lever screws, and the clamp easily swivels on the "L" bar thus giving easy access to the back of the piece you are working on. Assembly, and breakdown for travel, is extremely easy and is accomplished with one socket screw and the supplied Allen wrench. The Lowery is one of the few stands that is suitable for use in an easy chair, recliner, sofa or bed because it is placed to the left or right of your chair (as opposed to in front of you). It's base is only 6 mm (1/4 inch) thick so it slides easily under most furniture. Even if your furniture extends clear to the floor, it is probably reasonably easy to elevate the furniture with blocks enough to slide the base under without ruining the look of the furniture. 1. Because of the small base, the stand can be rather "tippy" when working on larger pieces...that is, it is not stable unless the base is held under a chair or weighted down in some way. Alternatively a Extra Large Base is available. 2. One would presume you could loosen the screw attaching the upper part of the stand to the lower part and conveniently swing the upper part forward to easily get into/out of your chair. You can do this, but, without holding the stand, it will tip forward unless it is under the base of the chair or weighted. Once again, this is not a major issue. Overall, our personal evaluation of this stand is that it earns very high marks for quality and versatility. Prices below are for the Silver-Grey Steel model. Prices for the Stainless Steel model are available on request. This clamp with its pressure plate design has the advantage of being able to clamp onto a frame at any point along the side or top. 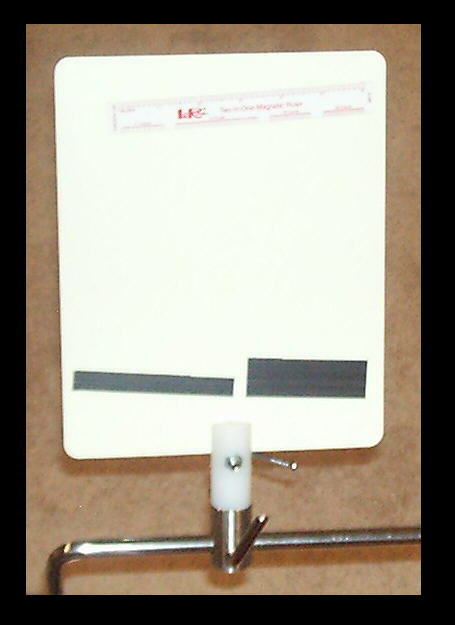 This accessory is designed to hold a magnetic board to hold instructional materials. 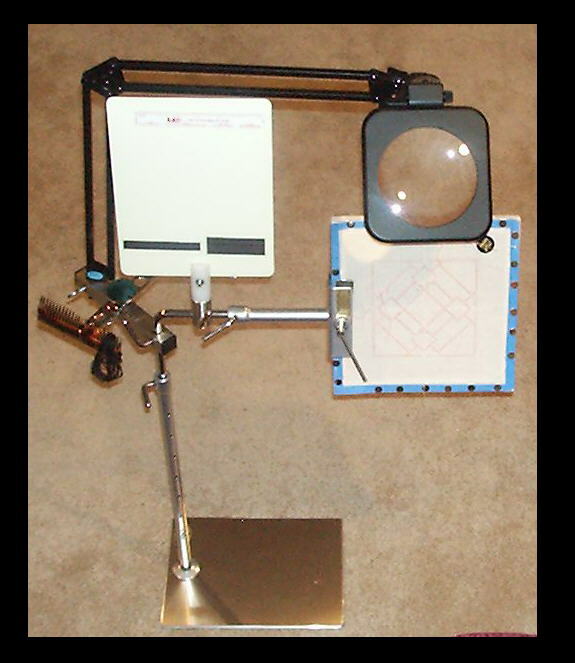 (The pictured Loran Magnetic Board is not included with the Magnetic Board Holder. 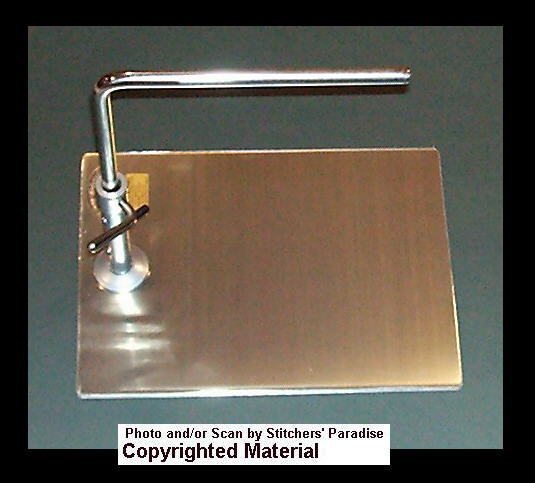 Loran Magnetic Boards are sold separately and retail for approximately $6.00...and can be ordered from Stitchers' Paradise). Extra long bars give you extra height or reach to help you to be more comfortable in your favorite chair or bed, particularly useful if you use a recliner. 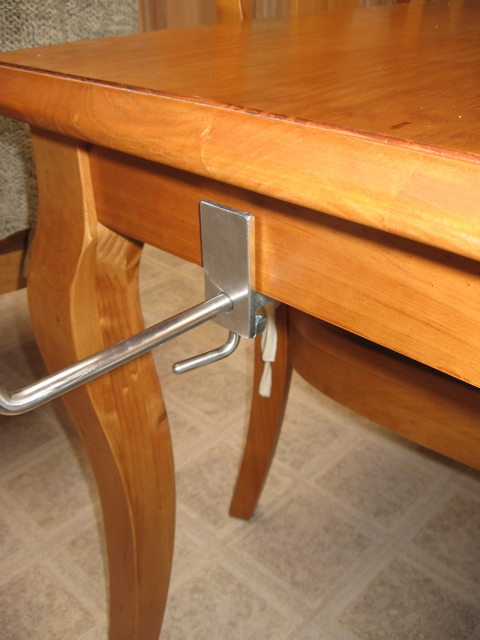 This adaptor kit will transform an existing Floor stand into a Table Stand. 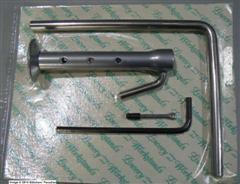 The kit comprises a short upright and short L bar, plus a securing pin and an Allen key. It uses the same base, and corner and/or side clamps as the floor stand. The lower image shows the adaptor fitted to the base plate. 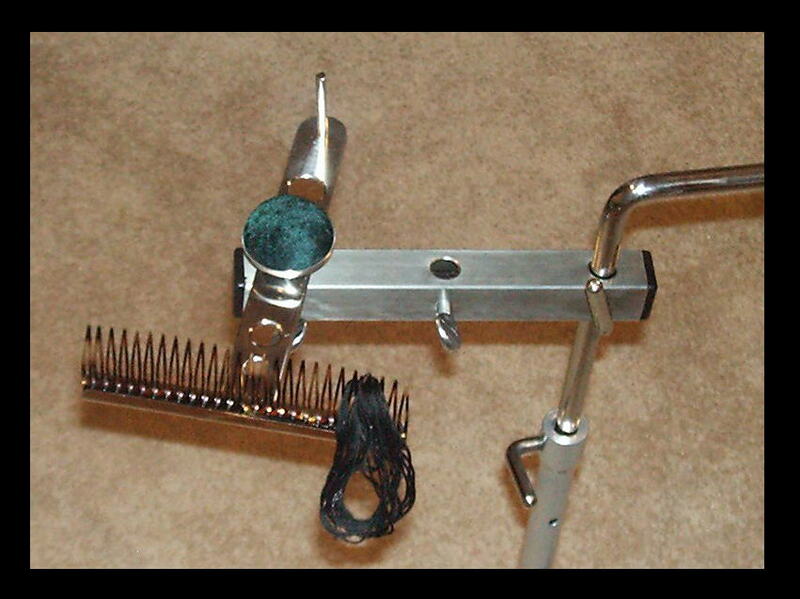 This kit does not include a base plate or a clamp. base plate 9" x 12.25" - only needed if an extra base is needed, rather than using the one that came with the Floor Stand. Center Mount. 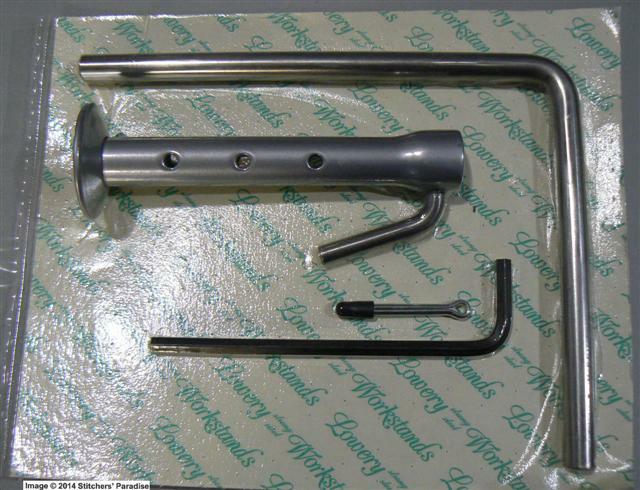 It can be mounted either on the horizontal or vertical section of the "L" bar. With six depressions, this will hold needles, threads, orts, etc.